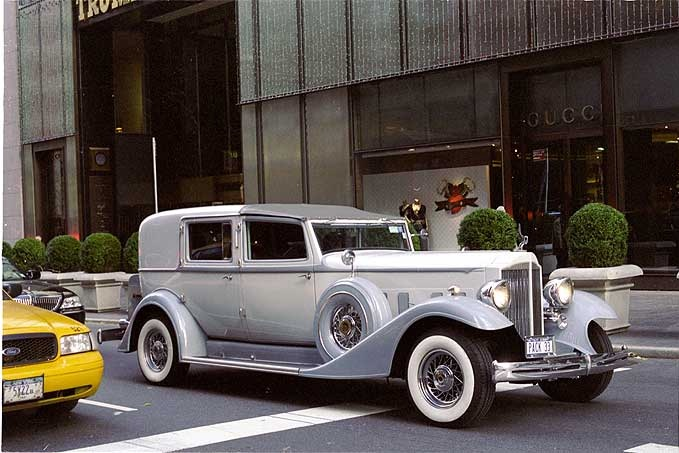 The ever delightful Fairfax (of Pigtown-Design fame) was thoughtful enough to send me a link to a story (“The Mark of a Gentleman”) that had me at the opening shot of a 1933 Packard (above.) It also had a lot to say about an element of style that seems to hve gone missing in most of today’s world. Thankfully the worldly gentlemen of New York are carrying the burden of tradition and style by wearing gloves in the cold weather. This entry was posted in Cultivating and tagged Bill Cunningham, Packard, The New York Times. Bookmark the permalink. Oh, thanks to you and Meg at Pigtown — that was a delight! Gloves are everything. I love my gloves! 🙂 The difference between going out looking nice without gloves and going out looking nice with gloves is the difference between day and night. This goes for both men and women. I love gloves in cool weather even more than in cold, because in cold weather it is more obvious. But when it is cool–late September days and evenings through early May in my climate–gloves are even more of a pleasure. Plus, you don’t get the flu from pushing grocery carts around with bare hands. Gloves add polish and quiet to jeans and a wool jacket and muffler, a cocktail dress and short dressy jacket, a man’s suede jacket and cords, even jeans and a t-shirt when driving. They are a requirement as far as I am concerned for traveling–airplanes, restrooms, doors, rental cars, etc. And, of course, one can’t garden or mow the lawn without gloves . . . or perform surgery . . . or curb the trash . . . or clean up after the doggie . . . or camp . . . or be a debutante . . . or attend the opera . . . or be Santa Claus . . . or build a snowman (that would be mittens actually) . . . And they are the perfect gift for the lady or gent on your gift list. Our 17 year-old daughter has several pairs of knit gloves in colors that she enjoys wearing with her sweaters and jackets. Our college-age son wears gloves all the time on campus as a matter of habit, because he grew up scouting and camping, and they were an important item to pack. My husband wears gloves because I keep buying them for him. Elegance is all in the details! Thanks for the shout! I knew you’d love this article. I wear opera length gloves because I hate cold wrists. I have a couple of pairs in plain black leather and some lined in silk. I also have “everyday” gloves in jewel tones of green, purple and red. They add a bit of splash to an outfit.